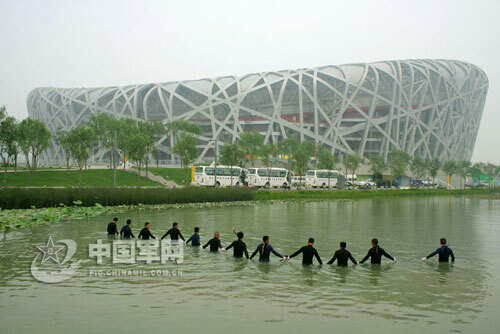 July 25, hand-in-hand combat divers from the People's Liberation Army South China Sea Fleet comb the artificial lake around the Bird's Nest where the opening and closing ceremonies and athletics events of the upcoming Olympic Games will be held. In the run-up to the 2008 Beijing Olympic Games, combat divers of a brigade with the People's Liberation Army South China Sea Fleet are losing no time in improving their skill of underwater exploration. They have been granted the responsibility of guaranteeing the safety in water or natural/artificial lakes around the major Olympic venues.